Umami Burger, the California chain, opened its first New York location in July 2013. Calling it a chain is really a bit harsh, as the burgers can be made of the traditional beef, but you will also find them made of things like duck or substituted by a portobello mushroom, for example. The restaurants are renowned for their loosely-packed mouth-watering triumph of flavor combinations. 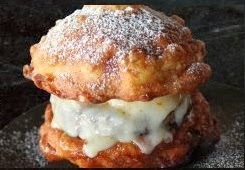 Give their celebration of meat week a try: the Voltaggio Monte Cristo burger, topped with prosciutto and gruyère fondue in a vanilla-custard fried bun. Served with maple syrup on the side. Delish. Notes: The Meat Week special will be served at all Umami Burger locations nationwide and will remain available as long as supplies last.